Faster clock speeds are here! 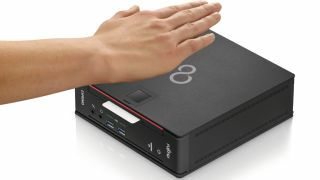 Fujitsu has pulled the covers off a glut of new Esprimo Mini PCs and Lifebook E series notebooks that extends Skylake's rapid clock speeds into the enterprise. The enterprise level machines are equipped with the very latest technology that ensures maximum productivity without a high energy footprint, minimised designs to save space and innovative features like Low Power Active Mode and Fujitsu PalmSecure authentication. The wealth of devices includes Esprimo Q and D compact desktop PCs and a range of Lifebook E5 and E7 notebooks that build on the popular Lifebook family with battery life that will astound many in the enterprise sector. Fujitsu's new premium Lifebook E7 notebooks come in three different flavours (13.3-inch, 14-inch, and 15.6-inch) and all benefit from sixth generation Intel Core 'Skylake' chips and DDR4 memory. The runtime of the machines is being championed by Fujitsu as the six-cell primary battery offers a run-time of 15 hours, extendable up to 20 hours with a second cell. The company has also added two new Lifebook E5 models with a 14-inch or 15.6-inch display plus the same processor and memory options of its larger sibling. Both come with the modular bay that the Lifebook range is well known for and there are plenty of upgrade options available as a result. The Esprimo Q series is designed very much with space saving in mind and is the eighth generation of the popular mini PC series. Fujitsu is promoting the new Low Power Active Mode on the minuscule desktop PC range that saves energy and attempts to persuade enterprises to replace desktop phones with unified communications and collaboration tools. Whilst the cost savings are clear, it saves energy by putting the desktop into a standby state similar to a smartphone and thus remains connected to the network at all times. The Esprimo D comes in to replace the outdated Esprimo C and E models and is a compact 10-litre desktop PC that offers up to 94% efficiency in the power department whilst at the same time reducing energy costs by 40%. All Esprimo Q and D models also come with Intel Core 'Skylake' chips. Both the desktops and notebooks will be available globally from October 1 and pricing will be available on a regional basis in due course.